Clinical Key contains all the content from MD Consult including full texts of books and journal articles. Your favorite texts, such as the Robbins and Cotran pathology titles, can be found in Clinical Key. Plus, Clinical Key provides drug information, CME sponsored by Cleveland Clinic Center, videos, images, patient education handouts, and First Consult, a topical point-of-care database. Clinical Key is accessible from the A.R. Dykes library database resources page. Take advantage of CME and other functions and print and download pdf's by registering for a personal account at the Register link in the upper right of the home page. Please see the Clinical Key Resource Center link at the bottom of each page for more details of Clinical Key features. A new web page, Ebola Outbreak 2014: Information Resources, is now available from the U.S. National Library of Medicine (NLM) Disaster Information Management Research Center. The resources on this page may be of value to international and local organizations and individuals providing Ebola outbreak-related services in West Africa, as well as friends and family of people in the affected region. MedlinePlus also has a web page on Ebola Health Resources for the General Public. Open Access Week (20-26 October 2014) is an opportunity for the academic and research community to continue to learn about the potential benefits of Open Access to scholarly research, to share what they've learned with colleagues, and to help inspire wider participation in helping to make Open Access a new norm in scholarship and research. The theme for this year's Open Access Week is Generation Open. This theme highlights the involvement of students and early career researchers in the shift in the scholarly communication landscape towards open. You can find out more about events from around the world on the Global Open Access Week site. 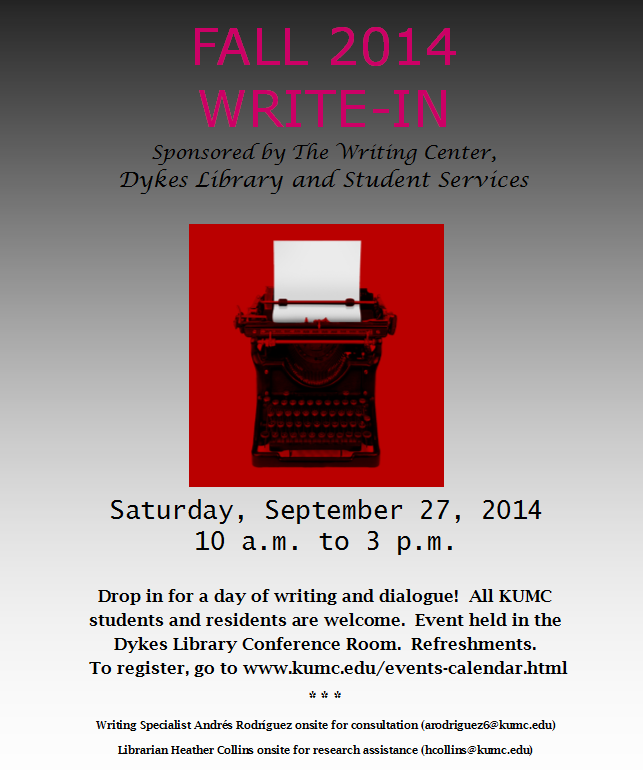 Look for KUMC's Dykes Library sponsored OA events later in November. Please go here for a list of KU/KUMC authors who were awarded KU One University Open Access funds for publishing in open access journals. Dykes Library is pleased to offer our Webinar Series again this fall. We encourage you to learn more about our services and all the excellent resources offered! MD Consult and Clinical Key were inadvertently deactivated on Aug. 29th. We are working on bringing them back up. Please keep checking our database list for MD Consult and the Clinical Key trial link on our library website banner in the event it activates over this weekend. We are in the process of licensing Clinical Key and then fully incorporating it into the library catalog and database list. Meanwhile, please stand by while we restore the CK trial and MD Consult access. Please note the hours of operation for A.R. Dykes Library in observance of the Labor Day Holiday. Labor Day: Open all weekend, closed Sunday at 10:30pm and Monday, all day. Effective August 18, 2014 the Pager Warehouse relocated to the the Hospital basement, B314. This will be a permanent change of location for the paging service. Dykes Library Staff have enjoyed servicing your pagers for more than 12 years. We bid farewell to this business and trust that you will enjoy the closer proximity to paging service. Scopus, a cited reference, article metrics and journal impact factor database is available on a trial basis through September 9. If you are familiar with Web of Science, you can compare it to Scopus. Web of Science is available on the library's database page. Please give Scopus a whirl and see what you think. SciVal offers access to author and institution research output. The A.R. Dykes library is hosting this trial through September 9th. With SciVal, you can build researcher groups, identify research areas, make comparisons to other institutions and countries, view publication sets and save your searches in MySciVal. To get started, follow the instructions on the registration link. Please register with your full KUMC email address and a unique secure password. To learn more about SciVal features, see the Help guide in the upper right side of the screen to view user manuals and guides. You can once again print to the color printer. Please go to the Information Desk on the ground floor to pick up your print jobs. We can deduct the amount for you from your GoPrint account our you can pay cash at .35/page. The color printer will remain behind the Information Desk because we have removed the Go Print software from it, thus, there is not a way for you to release your prints with a username and password. Stay tuned for news about free b/w printing starting July 1. The Archie Institutional Repository Handle Server is functional again. We're experiencing problems with network access to the Archie (DSpace) Handle Server. This prevents Handle URLs such as http://hdl.handle.net/2271/212 from resolving to content hosted at Archie. The content is still accessible at the Archie-specific URL, e.g. http://archie.kumc.edu/xmlui/handle/2271/212. Other locations you may check out are The UPS Store and the FedEx Print & Ship. View your account history, checkouts, and holds using CAS secure single sign-on. Add your own tags to books and journals. Save your "Favorites" or create your own personalized research lists. Narrow your search to eBooks, eJournals, and online resources. More easily filter by medical subject. Forward a Title or ISSN search to an ILLiad interlibrary loan request. 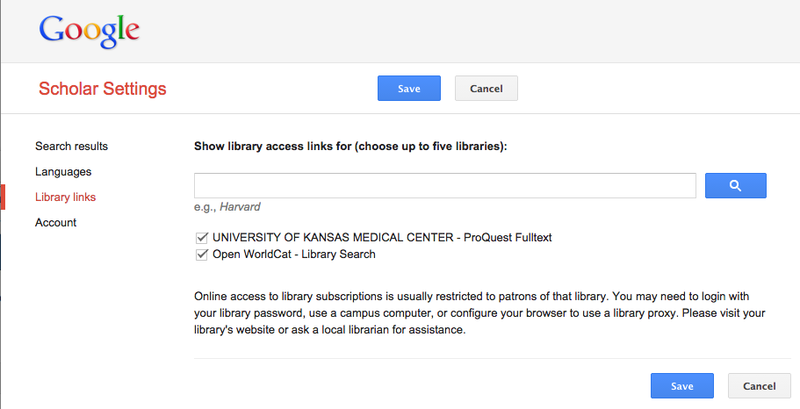 Find KUMC library items easier in Google, Bing, and other search engines. Limit a search to local notes fields using Advanced Search. Responsive design for any screen size. Use the Feedback tab on the catalog to let us know how we're doing.